It’s a tough ask to search for free stock photos on the internet, it involves frustration and sometimes you will get confused. Usually speaking free stock photography sites are an impossible find. Most of those companies that you believe are paid and like 123RF, Shutterstock they charge heavily about $15+ for a single photo. And some sites are probably not right to use, they have low-resolution pics, sometimes watermarked and sometimes unfocused. So, to help you find the best, we have few high-quality free stock photography sites that provide you, what is required, and that too without any cost. 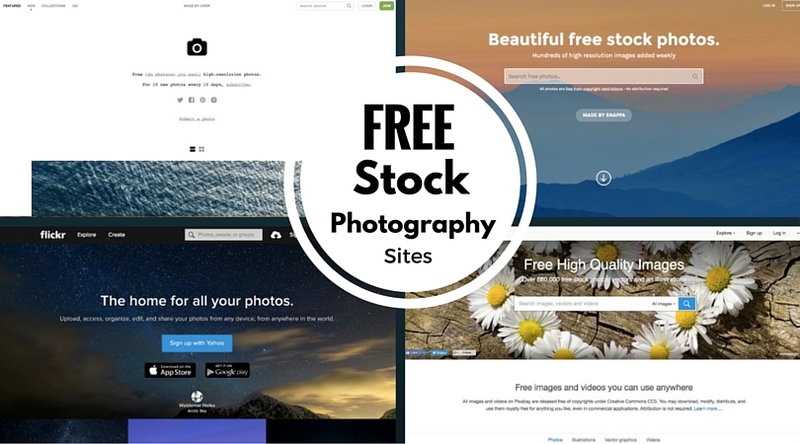 Below you will get a list of free and premium stock photography sites for web designers, business owners and people like you and me. You can get royalty free images here, which you can use for general, business, educational purpose or for advertising, printing or book cover in 400*300px size. For high-resolution images, you need to pay few amount. Though the images which are royalty free are small in size, the quality is perfect. The only requirement for using the image for free is to acknowledge the website and the image creator on the same screen where the image is used. If you like amazing graphics and pictures you are at right place. Here you’ll find high-quality images for free. There is a story behind every image being provided to you. You can also sign up for free photos every month by email. Almost all type of images is available here. It provides you with the options, in the form of tabs, from where you want to pick the image. Such as iStock, Getty, Dreamstime, Bigstock, Fotolia, and CC. Out of many available options if you are looking for royalty free images then opt for CC. It is one of the most popular free stock photos websites. It has over 680,000 free high-quality images which you can use anywhere. If you are looking for high-resolution photos, illustrations, Vector graphics, and videos, this the place for you. It is also popular among the free stock high-resolution photos website. It has a beautiful collection of high-quality images which you can use anywhere you want. Here you’ll see 10 new photos every 10 days, and every image is unique. Hundreds of beautiful images are uploaded weekly. It’s a wonderful place for those looking for royalty free images. All images featured are of high quality, resolution and are available for free. You’ll get a number of good images to choose from. No attribution required as all photos fall under the creative common public domain. Get unique royalty free stock photos, textures, digital backgrounds all for free. These photos are free for commercial and private use. Download images for free. With a straightforward navigation and powerful search tool that can just find your preferred keyword. An excellent collection of photos of animals, architecture, landscapes, flower, food holidays, portraits, and much more. You can browse 388,910 free photos and illustrations on the army, holiday, festivals, landscapes, wildlife, business, education and much more. With millions of images here on the site, you have almost all kind of photos available, primarily design and creativity topics are easier to get. Make sure to select Commercial use and mods allowed as a license. Amazing collection over 37 million stock photos, videos, and vectors. You are getting 7 days free trial where you can download 5 images per day. Everystockphoto provides millions of freely licensed photos from many sources and present them in an integrated search. You can get a membership for free to tag, rate, collect and comment on photos. All pics here are captured by Ryan McGuire of Bells Design and they provide new pictures weekly with excellent resolution and free of copyright restrcitions. No attribution required, high quality and effortless to navigate, an excellent collection of food pictures and for perfect for restaurant owners. This one is completely free for the customers. The commercial as well as non-commercial, both the services are available here on this site. A good collection and economic too! Look no further than Pikwizard when it comes to high-quality stock photography. It holds over 100,000 high-quality images, with 20,000 that are completely exclusive to the site. Pikwizard stands out because of the high-quality images of people that it holds, which are rare on other great stock photography sites. There is also no attribution required! Hope the information provided here helps you out!